So i did exactly the opposite, Did B.com and joined NIS (National Institute of Sales)… Since i had plenty of time and no social life, i decided to start a business. This is the time when websites had started to come up and people had just started putting up their business sites (1998) I learnt photoshop on my own and also a bit of HTML and used one of those WYSIWYG HTML editors. I was confident that i had the skills to make it a success. Since i had to put the word out, i got a lot of single page black / while pamphlets printed and started getting them distributed them with newspapers. I started getting calls and i landed a few clients and so i continued this strategy with various parts of Delhi. A year passed and i was doing decently well but my parents though that this had no future and so i was pushed to pursue higher studies in US. I did my B.Sc in Finance from Chicago and came back to India thinking i would land a plush job in a bank.. to my surprise i could not even land a call centre job (i choose to call this fate) Since then i have been doing various thing, tried my hand at modelling, did that for a year and then started a ecommerce website selling handicrafts (year 2004). My focus was exporting and i did get a lot of traffic on my website but little orders. Not too many people bought handicrafts looking at pictures, back then they did want to touch and feel. After that closed down, i started web hosting company (SpeedHost.in) with no prior knowledge on hosting… i just had a hunch that this was going to be a great service to sell. I knew that it would be challenge as hosting is a 24/7 business and i moreover i did not know what servers are and how i can sell. So i started reading up on hosting and found that once can start with a reseller account and a website. This was 2007 and SpeedHost.in was a brand new entrant into this domain which was already dominated by a few big companies (Probably you can make out buy now that i am not that big on research). Never the less, i was and still am a very customer centric person… I knew that there was lot or margin in hosting and the existing companies in India were selling at a much higher price as compared to US companies and that the Indian customer was still buying from India then US as business still paid in cheque deposit or cash deposit than online payment. 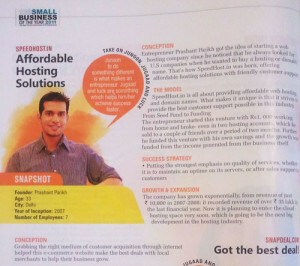 I capitalised on this and since i hand knowledge of web designing, i designed a UI where there was no clutter, the user did not have to look all over the page to buy the hosting package and that my cell number was clearly visible on all pages (yes, i provided 24/7 customer support for over 3 years) Since i was competing with some big players then, i knew that the only way i can grow is by being on the top of Google search, so for the next 1 year i devoted a lot of time on learning SEO and getting various search terms ranked on the top… by 2009, SpeedHost.in was ranked either #1 or #2 on almost all search keywords and the traffic started poring in. I moved in to a small office and took my first couple employees. There was no looking back then, in the next couple years, SpeedHost.in grew from 30-40 paying clients to about 4000. I am proud of the fact that the customer service we provided was unparalleled to even the hostgators of the world. From a startup investment of Rs.2000, SpeedHost.in grew to close to a crore in turnover a year with multiple servers located in India for the fastest speed and in house and outsourced employees. Then the bug set in to do something else in life and so SpeedHost.in got acquired by Directi. What can Thomas Knox teach entrepreneurs? 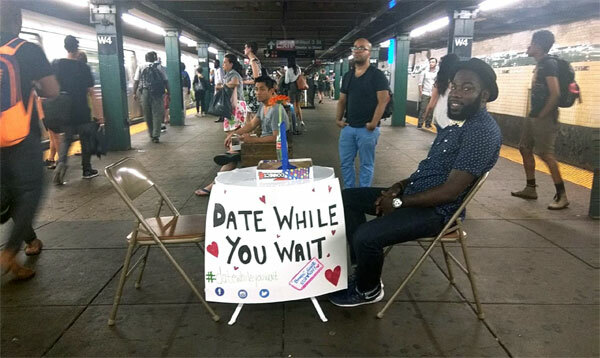 Thomas Knox from New York came up with this dating hack “Date while you wait” in the New York city Metro… basically Thomas wanted to do something to make people smile and enjoy their time while waiting for the Metro. I think entrepreneurs can learn a valuable lesson here… “it’s about meeting people and making connections”. And if you are single, i suggest you read these 5 quick tips on landing a date. Good Luck! Layoffs are a good news for startups? While their intention might good, i think their choice of words is very poor. Why would anyone hire an employee, if the said employee was let go from their previous job due to non-performance? And if such an employee was indeed hired by a startup.. do you think that startup would save money on training costs and other expenses? Would that employee be able to guide and mentor a team? It would have been perfectly acceptable if users were given an option to save their card on checkout but this somehow irritates me. Maybe for most users, this is perfectly ok and Flipkart does give you the option of removing your card from file from the “my account” menu but this is an additional step which i would not have to take, had i been given the choice in the first place.